20a. [Get a midnight snack, say] RAID THE FRIDGE. 28a. [Find a subtext of] READ INTO. “Find a subtext of” is a very awkward bit of locution. 37a. [Leave by horseback, as into the sunset] RIDE OFF. Have no idea why I misread “Jarlsberg” for “horseback.” See also 4d [Item strapped over a wheel of cheese] FEEDBAG. 46a. [Tour de France conveyance] ROAD BIKE. It’s going on now, as if you might know. Related: I’ve owned this book for years, and every time the Tour rolls around, I vow to read it and never do. 53a. [Unpleasant shock] RUDE AWAKENING. Strong peloton of theme entries, bookended by the longest and most appealing pair. But the hidden strength in this puzzle is to be found in the gruppetto, with fill such as FRET OVER [Worry about], FLAME WAR [Nasty online argument], CHAGRIN, HUMANE, and ADJUSTS. Not to mention NOLAN RYAN and HOLE IN ONE. Okay, so I mentioned them. 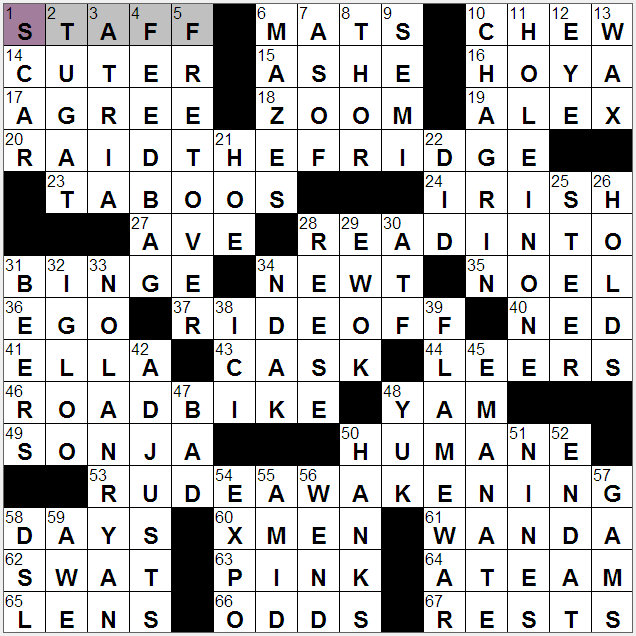 All right, time to play a round of drastic clue editing. 28d [Witherspoon of 2012’s “Mud”] REESE = [Witherspoon]; 34a [Former House leader Gingrich] NEWT = [Gingrich] (I doubt many folks know the evolutionary biologist Philip Gingerich. 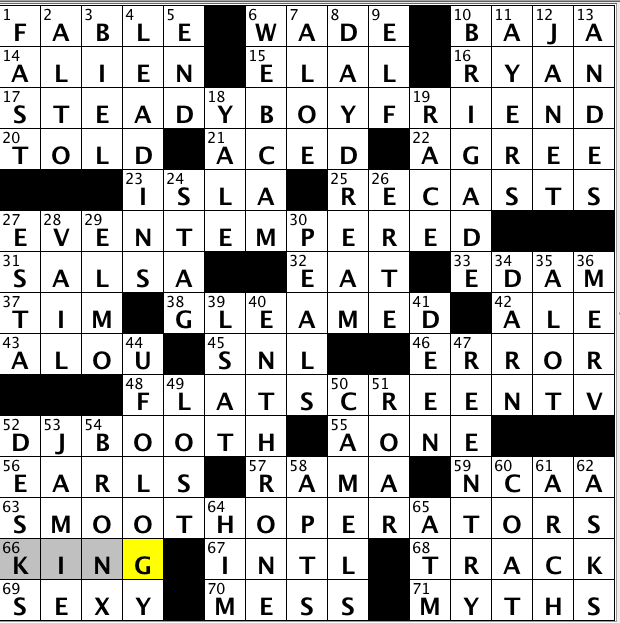 Oh wait, that has nothing at all to do with this clue or answer). 7d [Starting on] AS OF, 52d [Last until] END ON. 12d [Ogle] EYE, 44a [Wolfish looks] LEERS. 31d [Coors and Corona] BEERS. If you say so. The last across entry forms a coda to 1-across (previously mentioned): 67a [Pauses on sheet music] RESTS. And so it ends. Strong Monday offering. More or less standard early-week fare as a theme. Small twist is that the long theme entries are pinwheeled in the grid: across in the northeast and southwest, down in the northwest and southeast. It’s a less common arrangement, but still nothing FANCY (28d). Five-letter revealer placed across in the center: 38a [Things associated with 18- and 57-Across and 3- and 34-down] RINGS. Would have been more succinct to say “this puzzle’s longest answers,” but that’s neither here nor there. 18a. [Banner passed from host city to host city] OLYMPIC FLAG. Five interlocked circles. 57a. [A bride and groom may write their own] WEDDING VOWS. The nominal jewelry rings are traditionally exchanged contemporaneously with said vows. 34d. [Big top performance] CIRCUS ACT. Taking in place in a demarcated circle. Large circuses (hey, what’s the etymology there?) have about three rings, smaller ones understandably have fewer. So you already know what my consistency complaint is. What else can I mention? Should I hunt up other entries that could be associated with rings? Like 22a [Take turns] ROTATE? 40a [Arborist’s concern] TREE? Nah, not worth it, and not particularly appropriate. If you were feeling a bit on edge, solving today’s CrosSynergy puzzle by constructor Doug Peterson should help you straighten things out. [Bobby-soxer’s main squeeze] is a STEADY BOYFRIEND – this one makes me feel old, since I might use this phrase even today and the clue implies that it went out with bobby-socks. Something I hope all of us are, [Unlikely to hit the ceiling] clues EVEN-TEMPERED – that is unless you are doing a home renovation. [Sports bar fixture] clues FLAT SCREEN TV – I always enjoy entries that have initials in them with their uncommon letter sequences. I know, it doesn’t take much to amuse me. [Ladies’ men] are SMOOTH OPERATORS – Sade would agree. I enjoyed this theme, but think Doug took a bit of artistic license with a loose grouping of words that sort of mean the same thing. “Steady” and “even” seem a bit different to me than “flat” and “smooth,” but why quibble when the entries are this good. I’ll award my FAVE to another entry that has initials (and an unusual letter sequence), namely [Record spinner’s workplace] or DJ BOOTH. That it crossed the creepy and all together ooky UFOLOGY, which is one letter away from an uncomfortable science, gave it extra points. My UNFAVE was the [Celebrity chef in hot water] or Paula DEEN since, despite what you think about what she did, I really didn’t need to see a daily tearful apology from her on my FLAT SCREEN TV. Let’s move on, people! Time for only a 5-minute post today. SHARKNADO! Already made it into Peter Gordon’s Fireball Newsweekly last Friday, but BEQ didn’t disappoint his fans who were demanding SHARKNADO in today’s puzzle. I like TIFFANY LAMP, POLITE STARE, HATE-READING, PHALANX. Don’t know I HEART RADIO or KEYAGE. Don’t understand 12d. [One foot after another?] for SCHEMES. Is this about rhyme schemes? 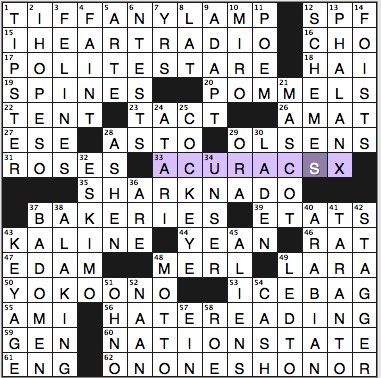 I had SCHEMER crossing ACURA CRX because I never remember those dumb car model “names” that are just numbers or non-word letters. ACURA CSX doesn’t sound familiar at all. Tough for a BEQ, no? Usually I’m in the range of 5-6 minutes, not 7-8. This entry was posted in Daily Puzzles and tagged Angela Olson Halsted, Brendan Emmett Quigley, Doug Peterson, Jeff Chen, MaryEllen Uthlaut. Bookmark the permalink. Super smooth Monday puzzle, Angela and Jeff! Wrestling MATS and NDAK shout “Angela! !” to me. NYT: Very smooth and fun, and my fastest ever! RAID THE REFRIGERATOR made me think for a minute that it was going to be terms of war. A very athletic puzzle! Wrestling MATS next to Arthur ASHE; A HOYA, a Fighting IRISH and ALEX Rodriguez playing golf– with someone scoring A HOLE IN ONE; NOLAN RYAN on a ROAD BIKE (Competing in the Tour de France) with SONJA Henie close on his heels. And then the STAFF RESTS– the beginning and end, both clued musically! Yes, I found that to be the only fault in the puzzle. It was so enjoyable and smooth that I forgot to look for the theme until I was finishing the last answer, so I couldn’t use the theme to get me any answers. NYT: Lovely vowel progression and whole heap of good downs! Brav(a/o)! PS learned (maybe for the second or third time) that it’s NOLANRYAN not RYANNOLAN! LAT: Very interesting concept! 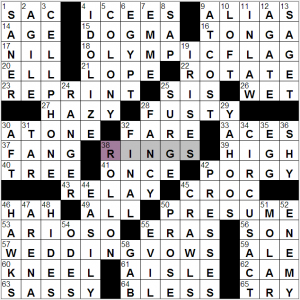 Also WEDDINGVOWS is an interesting new-to-crosswords answer! Yay PuzzleGirl and Jeff! I rode this one to a record Monday finish for me. Smootherino. I don’t know how to post a link but, if I did, I’d direct you folks to an 8-minute, animated video of Italo Calvino’s short story, “The Distance from the Moon”, with music by Erik Satie. It can be found on YouTube. Strangely, it’s narrated in Hebrew with English titles, although Calvino was born in Cuba and raised in Italy. It’s a weird, surreal tale of love and loss. Why, yes it is. Thanks. I have a question of Team Fiend. Do you guys have data on the highest rating that a NYT puzzle has ever received? I’m specifying NYT since the number of ratings is high enough to be meaningful. This year (so far), it’s a 4.85 rating for this puzzle by Patrick Berry. 2012, it’s 4.63 for this puzzle by Josh Knapp. 2011, it’s 4.88 (the highest of all) for this puzzle by Jeremy Newton and Tony Orbach.